Simon & Schuster, 9781501179655, 256pp. Overwhelmed by the news cycle and the state of affairs in our world? 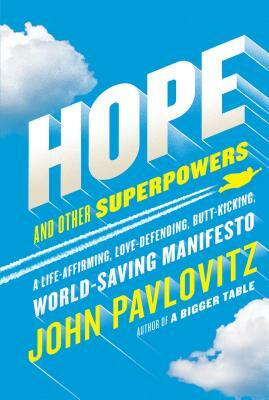 Pastor, blogger, and powerful voice in the Resistance, John Pavlovitz has the answer: this rousing and inspirational guide, drawing from lessons of our favorite superheroes, for how we can band together, live more heroically (and meaningfully), and save the world. In these pages, John offers a path away from the vitriol and toward com­passion, and a plan to transform our burdens into dreams and our outrage into activism. Drawing from lessons of beloved fictional superheroes, John shows us how to identify our origin story, build protective suits of armor, guard against our personal kryptonite, and vanquish our villains. He also identifies ten specific “superpowers” that we can enlist to make our lives and our world better. Along the way, he shares inspiring anecdotes and profiles about ordinary people who saw a gap in the world in empathy or kindness or gratitude and decided to fill it. Hope and Other Superpowers is an invitation to anyone hoping to be the kind of person the world so desperately needs—the kind who can save it. In other words: it’s an invitation to you. John Pavlovitz is a pastor and blogger from Wake Forest, North Carolina. In the past two years his blog, Stuff That Needs To Be Said, has reached a diverse audience of millions of people throughout the world, with an average monthly readership of over a million people. His home church, North Raleigh Community Church, is a growing, nontraditional Christian community dedicated to radical hospitality, mutual respect, and diversity of doctrine. John is a regular contributor to Huffington Post, Relevant Magazine, Scary Mommy, ChurchLeaders.com, and The Good Men Project.